Ralph Spencer was born in 1859 in Connecticut and became a businessman with interests in retail and oil. He is known as the chief developer of a small town in the State of Georgia called Tallapoosa. In 1888 the colorful businessman moved to Tallapoosa and founded the Georgia Fruit Growing and Winery Association. Spencer had a vision, he wanted to create a wine region and planted grapes on 2000 acres. 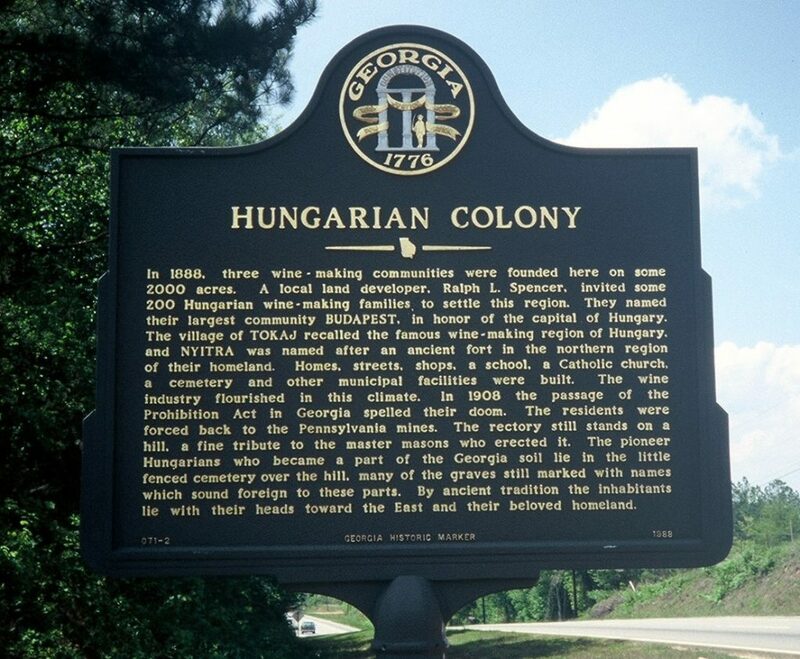 Hungarian immigrants were recruited from the coal mines of Pennsylvania and since most of them were poor farmworkers in Hungary before immigrating they were happy to get back to agriculture. The first fifty families established a community and named it Budapest. Each family was allotted 10 acres. More Hungarians arrived and founded another village called Nyitra and the surrounding hillsides were soon covered with vineyards. All this changed in 1908 when Georgia’s Governor Hoke Smith signed the state’s Prohibition Act banning the manufacture, sale, barter, or giving away of alcoholic beverages. Local Protestants were long-time supporters of the alcohol ban on religious grounds, but the immediate reason of the Governor’s action related to the bloody Atlanta race riots of 1906. White citizens in Atlanta unfairly blamed drunk blacks for starting the riot and pushed the Governor to ban alcohol in the entire state. Needless to say that was the end of Georgia’s wine business. The wineries went bankrupt and most of the Hungarian families moved back to Pennsylvania. In 1888, three wine-making communities were founded here on some 2000 acres. A local land developer, Ralph L. Spencer, invited some 200 Hungarian wine-making families to settle this region. They named their largest community BUDAPEST, in honor of the capital of Hungary. The village of TOKAJ recalled the famous wine-making region of Hungary, and NYITRA was named after an ancient fort in the northern region of their homeland. Homes, streets, shops, a school, a Catholic church, a cemetery and other municipal facilities were built. The wine industry flourished in this climate. In 1908 the passage of the Prohibition Act in Georgia spelled their doom. The residents were forced back to the Pennsylvania mines. The rectory still stands on a hill, a fine tribute to the master masons who erected it. The pioneer Hungarians who became a part of the Georgia soil lie in the little fenced cemetery over the hill, many of the graves still marked with names which sound foreign to these parts. By ancient tradition the inhabitants lie with their heads toward the East and their beloved homeland. Hello. There is a family story which I and my sister are finding difficult to verify about a young man called Janos Lazar. He was married to my father’s aunt, Maria. She was my grandfather’s youngest sister. Janos and Maria were childhood sweethearts and were married only a few months when he was called up for active service in my grandfather’s regiment of Honved Hussars, Janos being an ensign in reserve. This was at the beginning of August 1914.He was wounded at a place called Aklos, northeast Hungary. Now in Russia? He was taken to Kolozsvar ( modern Cluj) in February 1915. His wife was volunteering to nurse wounded soldiers at the military hospital and recognised her poor husband who was severely injured. She asked the surgeon, professor Altorjay who was a family friend what his chances were. Not recognising him immediately said he had none. She calmly went into a side room and wrote a letter telling the hospital authorities that she had no wish to outlive her husband and putting her pistol into her mouth she blew her head off. They are buried together in present day Oradea Mare in the Rulikowsky cemetery. This news made the papers in Hungary and abroad. Nothing is eternal … not even the car industry in Hungary, … sustainable is just knowledge and health. That does not exist in Hungary. You may be interested to learn that the wine grape industry in West Georgia, US has been revived and is thriving and growing! Its Hungarian roots have not been forgotten, and the history of the early wine years is shared with tourists and industry members alike. I would like to reconnect with a young man from Hungary who was doing research on this subject in the month of June 2018 at the Budapest Cemetery and environs.I suggested he visit the Museum in Tallapoosa which has additional information on the wine making and resort era of Tallapoosa’s history. I understand he was planning a web site concerning the different areas in the US where Hungarian immigrants settled in the late 19th and early 20th centuries. I would love to contact him.